A traditional local dish that has long been enjoyed in the Unuma area of Kakamigahara City, Gifu Prefecture, where carrots are grown in great numbers. It is rice cooked with ingredients such as carrot, shiitake and deep-fried tofu. It is called "Kingyomeshi", because the strips of carrots peaking through the mixed rice look like goldfish. It has appeared frequently at festivals and meetings of the village from a long time ago, and is also served for school lunches in Kakamigahara City. Parking Capacity：Use the adjoining Machiyakan parking spaces. Gorgeous Kingyomeshi kamameshi that delights not just your taste buds, but also your eyes! "Hananoki", a merchant house built in the early Showa period now used as a restaurant in the old Nakasendo Unuma-juku, offers a variety of kamameshi rice. The kamameshi menu lists more than 10 kinds, including edible wild plants, mixed ingredients and seafood. The carrots are the star from seasoning to serving in "Kingyomeshi kamameshi", made using local Kakamigahara carrots. This is a superb dish, gorgeous and sweet. Please call us to confirm. ＜Messages from the Staff＞ Come and try our kamameshi rice, made by cooking the locally-produced Gifu Prefecture's special variety of rice, "Hatsushimo", together with the ingredients so all the tasty flavors are condensed in one. Garnished in a simple manner, so that the carrot, the star of the dish, stands out. A comfortable space where you can settle down and relax as mind and body is soothed. 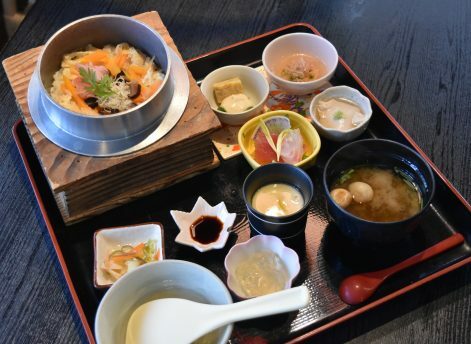 The lunch set meal with a choice of 5 kinds of kamameshi rice is many people's favorite. A tasteful building surrounded with nostalgic scents from the Showa period.